We provide jute rug cleaning in location surrounding Kuala Lumpur and Selangor, Malaysia. Jute will dry a lot quicker than any other fiber it was discovered by our skilled rug cleans when they were inspecting some very old rugs waved with jute. Over a period of time, jute disintegrates, and the textiles that were once wonderfully woven fall apart. It is also possible that some specific areas will rot faster than others because of spills on them. When the jute becomes very old or rots, nothing can bring it back or salvage it. It is just like when a skeleton is crumbling apart; you can’t support what has no strength left in it. If your rug cleaning company does not take care of the deterioration on time, your rug can literally fall apart on you unexpectedly. Yellowing and browning: If the jute rug seems like it already started displaying signs of cellulose browning issues, you may try cleaning only the surface of the rug. In that way, the jute backings will be exposed to a very little moisture. You can also use a low moisture cleaning method, or you can clean with a dry compound. 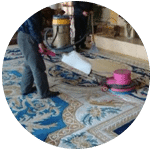 Some cleaning services do not offer encapsulation cleaning of rugs or dry compound cleaning because they feel it does not give them the cleaning to desire. Some people use upholstery tool to only clean the surface of the rug and protect the jute backing from getting wet. For the rugs that have an extreme browning issue and serious soiling, dry compound method is the only possible solution.If you fully wash your jute rug because it requires a thorough cleaning, then applying an acid rinse will help reducing some of the cellulose browning. Also, if you dry your jute rug fuzzy side down (flat and face down) on a surface that is very clean, and put high speed air mover on top of it to dry, you can make the browning problem wicking move over to the back side of the rug, and the browning will be at the back of the rug rather than being on the front side. 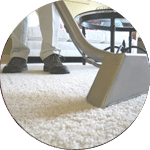 Removal of Odour: If a jute fiber foundation rug has a very strong odor, and it is a polypropylene rug, then you can use some oxidizers such as Oxcelerate or OSR. Make sure you don’t use any oxidizers on wool rugs. 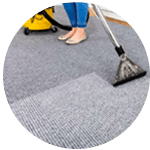 Our customer service team will reply to your request within a few working hours to find out more and discuss further about the jute rug cleaning service that you require. Subsequently, we will issue you a quotation and an invoice for the jute rug cleaning service. Our jute rug cleaning service is available in Peninsula Malaysia from Kuala Lumpur, Selangor, Ipoh, Johor, Malacca and Penang. Speak to our team to enquire more about the jute rug cleaning service that we provide in your area. I have a special request for my jute rug cleaning service, can this be done? 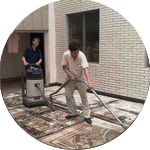 We understand that sometimes our customer have special requests for jute rug cleaning service with regards to timing and other matters such as stain removal. In this scenario, you can contact our customer representative team at 017-232-6491 to discuss your jute rug cleaning request.